This is my most recent writing guide. It has everything a student needs to learn how to craft a winning narrative-style essay for a college application, plus some. It’s really a writers’ toolkit, patient packed with easy-to-find tips and advice on how to use literary techniques, strategies and devices to power your writing. This is an ideal guide for any student who really wants to not only nail their essay, but also practice and learn invaluable writing skills that will help in college and the workplace. 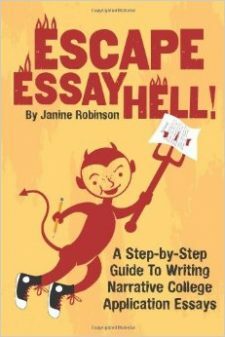 Instead of taking student step-by-step through the brainstorming and writing process (like Escape Essay Hell! ), this is a guide for ambitious students who want to spend the time to really enhance, develop and craft their essays into effective, meaningful and outstanding writing pieces.